The UK government has announced the rates of customs duty (tariffs) that will apply to imports of goods into the UK if the UK leaves the EU with no deal. The tariffs will be valid initially for 12 months. The government will be consulting on future permanent tariffs during this period. The new regime would affect only imports into the UK. The announcement lists 21 seafood products that will incur duty. These new tariffs mirror the tariffs that currently apply to seafood product imported into the EU, and range from 7.5% to 15% for unprocessed fish and are set at 24% for prepared or preserved tuna. 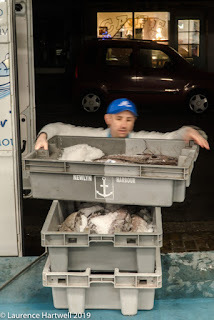 A large proportion of the seafood commodities that are imported into the UK are not listed in the government announcement and therefore will not incur a duty on import. These products include salmon, whitefish (other than monkfish), pelagic fish and bivalve molluscs. Among the zero-tariffed seafood commodities are those currently covered by the European Union autonomous tariff quotas. The government announcement can be accessed through this link. All seafood from Chile will be zero tariffed except for the seven tariff lines listed that cover prepared and prepared tuna. The arrangement for the Faroe Islands allows an additional five product lines of frozen fish and shrimps to be tariff free. Imported seafood from countries currently benefiting from the GSP scheme will continue to benefit from the same low or zero tariffs after a no-deal exit from the EU. Preferential tariffs are listed for seafood from Israel, Palestine and Switzerland. The UK government has released a draft list of tariff quotas for imported products, including seafood. Where a tariff quota applies, it will be possible to import limited amounts of particular types of seafood at a lower rate of duty. The quotas are listed in the Tariff Quota Rate Reference Document, available here. This Tariff Quota Rate Reference Document has been published in advance of a Statutory Instrument establishing the tariff rate quotas and establishing a regime for managing them. Management will be mostly on a first-come first-served allocation system. However, until the statutory instrument is available, there is no further detail on their application or their management. Seafood product quotas covered by the Autonomous Tariff Quotas (ATQs) are listed under Part B, Section 2, of the Reference Document. As these products will be zero tariffed if the UK trade tariff comes into force, irrespective of the volume imported, there are no tariff quota volumes associated with them.